Happy New Year from the CDGE! As you prepare for your spring semester, please keep in mind the following programs at the CDGE. Please attend and also feel free to encourage community members to engage. If this list looks daunting, we encourage you to keep abreast of upcoming events on or google calender. Jan 17 MLK Interfaith Prayer Breakfast, 8am Babcock Dining. RSVP here. Jan 17 Living and Learning from CRASH. A Workshop. 4-8:30pm including dinner. Lean Lecture Hall. Sign up here. Jan 19 Campus Climate Summit (Follow-up to the open forum held in Lowry fall semester) 11am, Babcock Dining Hall. Please contact us if you would like to be part of this event. Jan 26 “Examining the Education-Prison Pipeline” Kauke 038 7:00-8;30pm. Conversations in Global Engagement (Social Sciences). Please RSVP here. Babcock Dining Hall Jan 19 5:15pm. Ambassadors Dinner. Wooster Inn Jan 25 at 7pm. I-Seminar. Babcock Dining Hall. Jan 26, Feb 2, 9, 16 and 23rd, 11am to 1pm. Students present inter-disciplinary IS projects that are in-progress. Lunch is provided. Topics include social justice, identity, culture and art, and global engagement. See our Wiki for more details. Off Campus Studies -Worldly Wednesdays 4-6pm – Jan 25, Feb 29, Mar 28 and Apr 28. “Debating for Democracy- “Letter to an Elected Official” Due at 4pm Feb 1st to Director of Project Pericles Thomas Tierney. Conversations in Global Engagement (Athletics). Please RSVP here. Babcock Dining Hall Feb 2 6:30pm. Ambassadors and Girl Scouts Thinking Day – Saturday Feb 18 from 1-4, Wishart. “After the Cameras have Gone” Global Engagement Network Summit. February 25. Invited guests include Dr. Elaine Enarson and Trent McNelly. Intercultural Leadership Institute (Tentative March 30-31 or 4/13-14). Safe Zone Training (Date TBA) will include lunch and a Facilitated Dialogue on GLBTQ issues. Dr. Kent Kille, of Wooster’s Department of Political Science, sent this information to CDGE, which we wanted to pass further on to our readers. The United Nations released it’s first-ever report on the human rights of gay, lesbian, bisexual, and transgender (GLBT) people around the world, which details laws pertaining to the GLBT community, ranging from full marriage rights in some countries to imprisonment and the death penalty for those caught engaging in homosexuality in other countries. The report, released by the UN Office for the High Commissioner for Human Rights “outlines “a pattern of human rights violations… that demands a response,” and says governments have too often overlooked violence and discrimination based on sexual orientation and gender identity.” The report details these patterns of violence against the GLBT community, finding that “violence against LGBT persons tends to be especially vicious compared to other bias-motivated crimes.” Unfortunately, a large number of these crimes go unreported because victims do not trust local police or governments, or are afraid of being identified as GLBT and encountering further discrimination and violence. 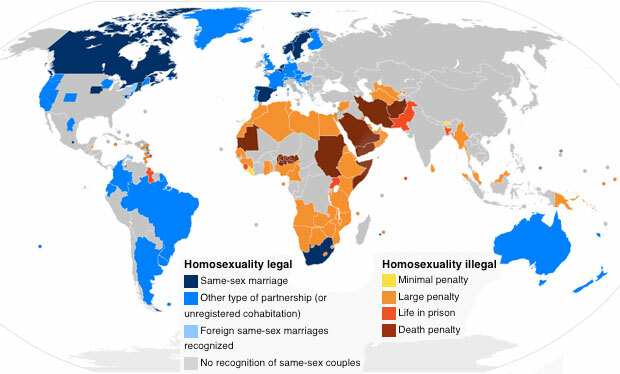 This map from 2009 shows the different levels of acceptance and rejection of GLBT human rights around the world, ranging from the death penalty and imprisonment to full marriage rights. The release of this report also follows unprecedented announcements from the President and Secretary of State, Barack Obama and Hilary Clinton, directing United States agencies and departments to promote the rights of the GLBT community in diplomatic actions and foreign assistance around the world. Click here for video of Secretary of State Hillary Clinton’s landmark speech to diplomats in Geneva. For further information about GLBT rights and issues around the world, check out ILGA (International Gay, Lesbian, Bisexual, Trans and Intersex Association) website for information and graphics that further explain the global situation. First of all, the Center for Diversity and Global Engagement would like to wish everyone the best of luck on finals this week as students here at Wooster finish up exams and papers! We hope that everyone has a great break for the holidays, but we are excited for the events that we are bringing to Wooster after the break. Beginning Tuesday, January 17th, CDGE and the Office of Multi-Ethnic Student Affairs will begin its Celebration of Dr. Martin Luther King, Jr. with two events – An Interfaith Prayer Breakfast at 8am and Living and Learning from Crash starting at 4pm. The Interfaith Prayer Breakfast is open to all students, staff, faculty and community members and will take place in the Babcock Dining Room. We will share some of King’s writings and offer prayer from many faiths and perspectives in support of King’s reach for peace and equality. We ask that you please RSVP at mlkprayerbreakfast.eventbrite.com. Living and Learning from Crash is an all-evening workshop featuring a viewing of the award-winning film Crash and extensive discussion and activities afterwards to delve into the issues of prejudice and discrimination that surface in the film. The workshop will start at 4pm in Lean Lecture Room in Wishart Hall, and will end about 8:30pm. Dinner is included for free with this workshop, so we ask that if you do register, you intend to stay for the full workshop experience. This event is open only to COW community members – students, faculty, and staff. Please register for this workshop at mlkcrashworkshop.eventbrite.com. On Wednesday, Jan 18th, OMSA and International Students Association will collaborate on the Global Leaders Dinner. This event, starting at 6pm in the Lowry Ballroom, will highlight the lives and work of various leaders from around the world, like Dr. Martin Luther King, Jr., Ghandi, Mother Theresa, and others. Food in the International Food Station in Lowry will feature favorite foods or popular dishes from the countries of these leaders, and students and faculty will speak on the importance of these leaders to their respective countries and to the world. OMSA and Cross-Cultural Connections (CThree – formerly known as Cross-Cultural Living Experiences Program (CCLEP)) will collaborate on our Thursday, Jan. 26th event, Examining the Education to Prison Pipeline. This discussion will examine the racial and socioeconomic inequities that currently exist in our school system, which lead to disproportionate representation of some identity groups in the American prison system. This event will take place at 7pm, but the location is currently TBD. Our final even will take place Saturday, Jan. 28th, and will be a service project completed alongside Wooster High School students. This event is still being planned, so please be sure to check out the Center for Diversity and Global Engagement on Facebook for the latest information! There are plenty of other CDGE events coming up directly after the break as well. Thursday, January 19th marks the return of our Conversations on GLocal Engagement, which starts at 5:15pm in the Babcock Dining Room. This first conversation of the second semester will be focused on the Social Sciences, and can be RSVP’ed for here: http://www.eventbrite.com/event/2294627292 . Thursday, January 26th also marks the return of I-Seminar, which offers seniors the opportunity to present their diversity and global engagement related Independent Study projects if they have been nominated by their IS advisors. Off-Campus Studies will also host a Reception and Open House for those Wooster students returning from their studies and journeys away from Wooster this past semester on January 30th. We are very happy to have these students back on campus with us and are excited to hear about their experiences! Again, best of luck during finals, and have a very safe and relaxing winter break! Pack light if you are traveling! We will see you all when you get back in January! Legislative Hearing Competition – Win a Trip to New York! Project Pericles invites students interested in social justice and community action to attend an informational session on the Legislative Hearing competition, which is part of Pericles’ Debating for Democracy Program. This program involves letters to legislators written by teams of students from the 29 Periclean colleges. Each Periclean institution can submit 4 letters, and a panel of national judges will select 5 letters, representing 5 different schools, for 2-person team presentations at the 2012 Debating for Democracy Conference. The conference will be held at The New School for Liberal Arts, in New York City, on March 22-23. Transportation and lodging costs are provided for students who have been selected to present their letters at the hearing, and the top letter-writers will receive a financial prize that is to be used to continue working on their issue during the following academic year. Consequently, this competition is not open to seniors. To learn more about this event, please attend an information session at 4 p.m. on Monday, Dec. 5, in Severance 009. On December 1st, the world will take time to recognize World AIDS Day, which symbolizes a chance to stand together and remember those we have lost to these worldwide epidemic, but also a time to recommit ourselves to fighting for a world where there not only exists a cure for AIDS, but affordable and easily-accessible healthcare and anti-discrimination policies for those living with the virus. The Center for Diversity and Global Engagement will recognize World AIDS Day this year by hosting three panels from the AIDS Memorial Quilt, the largest community arts project in the world and a visual reminder of those we have lost to this pandemic. CDGE will house two panels during the day in the Babcock Formal Lounge, while the third panel will be hung up in the main lobby of Andrews Library from the second story balcony. Daily tours of the Quilts will be offered, starting each time in the Andrews Library Lobby. On Tuesday, the 29th, tours will take place at 9am and 4pm. On Wednesday through Friday, the 2nd, tours will take place at 10am and 3pm. Tours can also be specially scheduled for classes, student organizations, residence halls, departments, offices, and community organizations by emailing Joel Pettigrew at jpettigrew@wooster.edu. Hosted by CDGE and Cross-Cultural Living Experiences Program, join us at 7pm on Wednesday, November 30th in Lean Lecture Room for this documentary viewing and discussion. On World AIDS Day, Thursday, December 1st, CDGE will host a Candlelight Ceremony at 7pm in the Babcock Formal Lounge, honoring those we have lost to the epidemic but recommitting to an equal and just world for those living with AIDS and eventually a world without the disease. We hope to see you out at all these events or on a tour this week! But wait, CDGE has many more events coming this week and the rest of this semester as well! Deadline to nominate your student for I-Seminar. Nominate your student to present their unfinished multidisciplinary or interdisciplinary IS. Nominations are due to Nicola Kille. Shared Futures – Inclusive conversations in Global Engagement. Come to CDGE Dining hall at 5:15pm onward for the second of multiple conversations on how you understand global engagement. Please sign up for Thursday’s event and for subsequent events by visiting the CDGE wiki http://goo.gl/T9yiQ . We hope to see you out at any or all of these events!